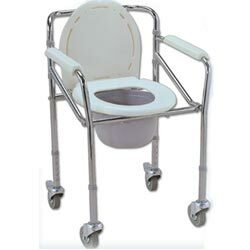 Folding Commode With Casters can be used as a toilet safety frame, a raised seat or outside the bathroom as a stationary commode. They are easy to clean and are durable with power coated frames. Foldable Steel Commodes can be folded easily in seconds making it ideal for storage in small living areas, carrying and traveling.